Finally got the gates fitted this morning on the new alpaca paddocks with a day to go before Chrissy Eve. The old 'lucky charm' giving me a hand helped to get us through without any major hiccups. 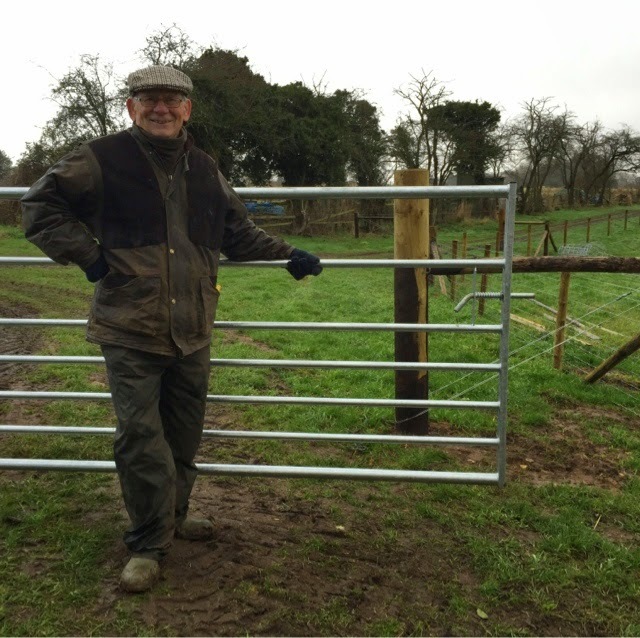 Here he is- my Dad, almost 84 and as proud as punch on the last of the three gates we fitted this morning before 1pm. 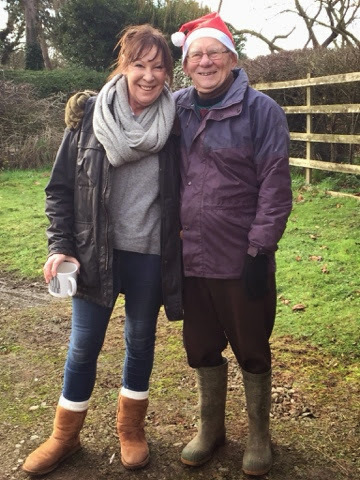 Then we were off on the trot all afternoon for Whoopy Daisy collecting stuff from the butchers bakers and candlestick makers - as you do. 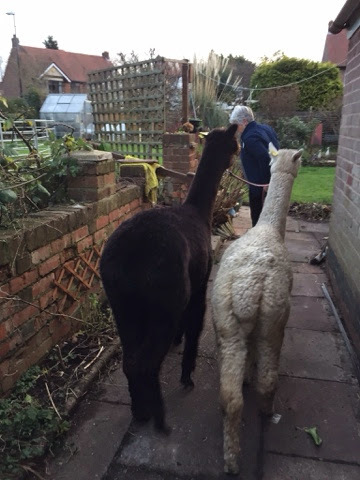 Up at the crack of sparrowfart this morning at TOFT to place two alpacas on Giorgio and Charli's lawn in Coventry whilst Charli was still in bed. 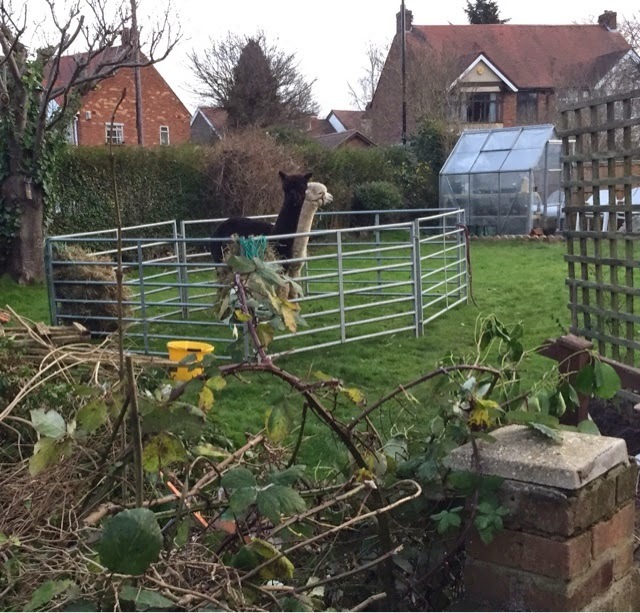 All part of Giorgio's secret surprise to have his girlfriend Charli wake up this morning with two of her most favourite animals in the world on the lawn and then to accept his proposal of marriage. 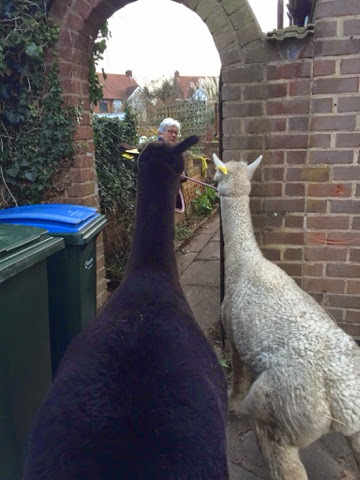 We snuck the hurdles and the alpacas through the back gate early doors without disturbing Charli and returned later to find the happy couple engaged and overjoyed and Charli sporting a large diamond ring and thoroughly surprised. Nice one Giorgio! 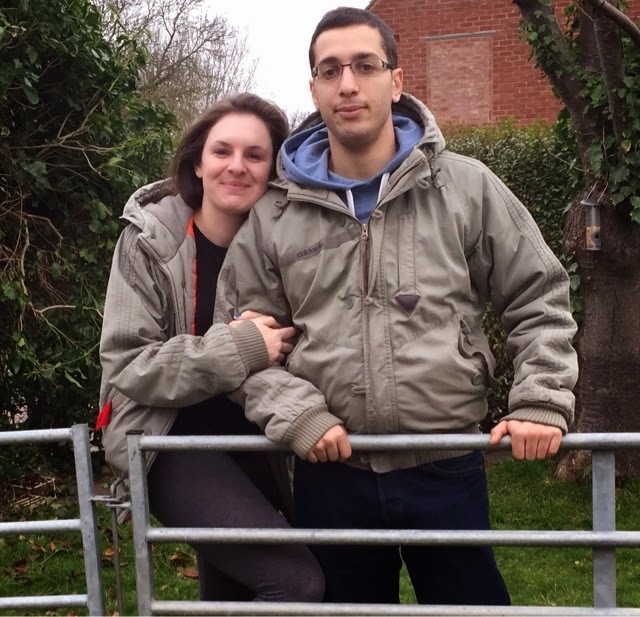 Job well done and thankfully a happy ending. 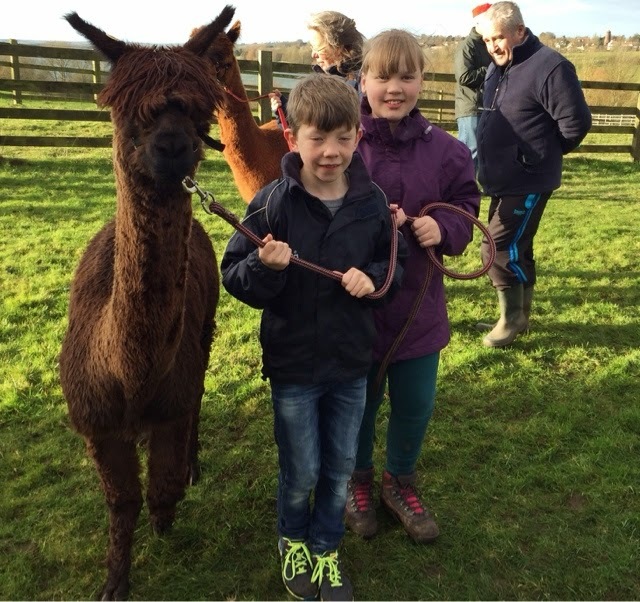 Our alpacas are now back in our paddocks and TOFT alpacas has a new unforgettable alpaca experience to add to the archive. 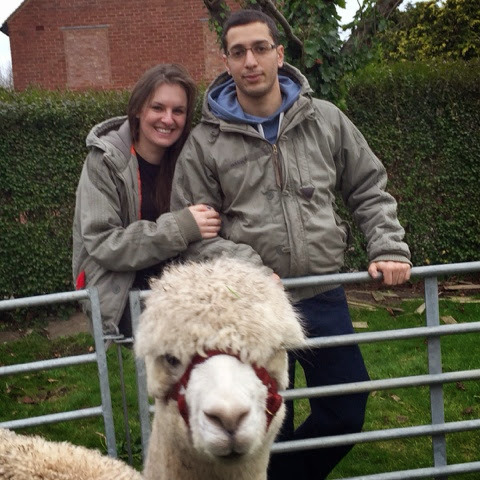 Congratulations to Giorgio and Charli and best wishes for your future life together from all at TOFT alpacas. 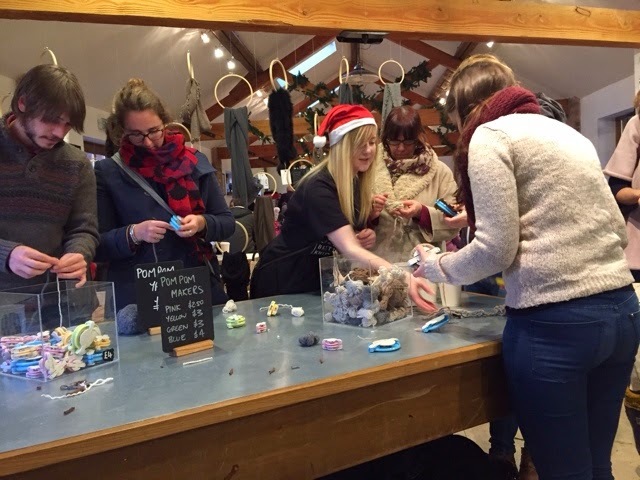 Congratulations to TOFT talent Kerry Lord and her magnificent team of yarn elves who worked tirelessly for for the TOFT Xmas opening day. 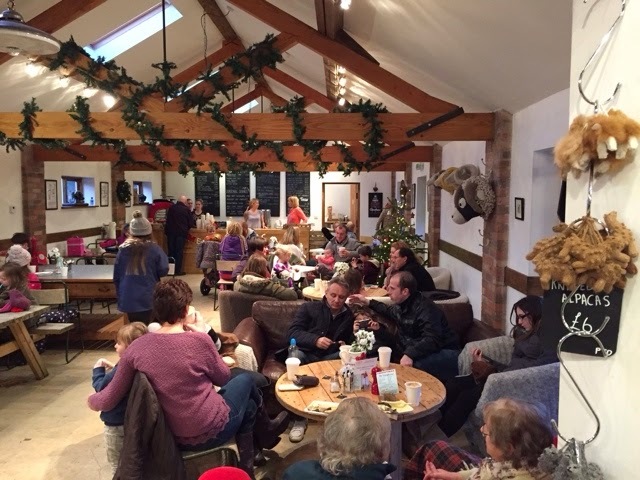 Closely followed by a huge TOFT welcome to Jenny and the Cornflower Cafe fairies who kept all comers well fed and watered. 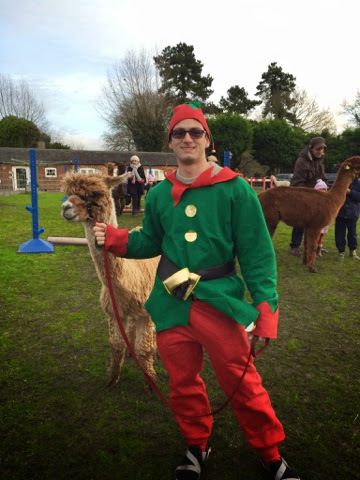 A massive thanks to Elf and Safety ( Scott and his Uncle Keith) worked the hundreds of cars on and of the temporary car parks with a smile and the efficient authority and a quiet confidence which only comes with experience. 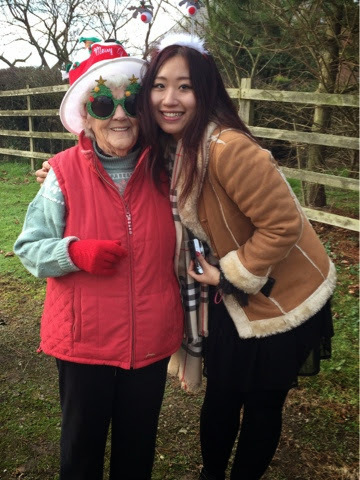 A big hug for Aunty Lorna who met and gret all our visitors with her best a smile and a warmth which set them on their way to a great day. 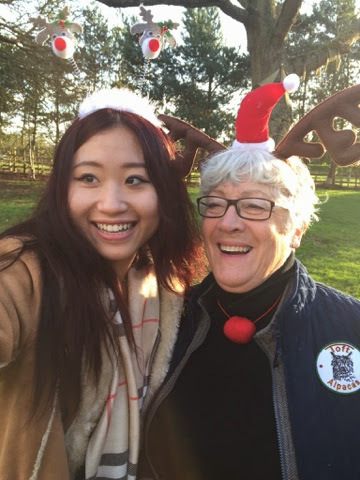 Huge hugs for the herds women team of Freya and Linda who braved a fierce wind all day to breathe confidence and joy into all the halter walkers, whilst Whoopy Daisy walked and talked crowds of people through the pleasure of our alpacas. 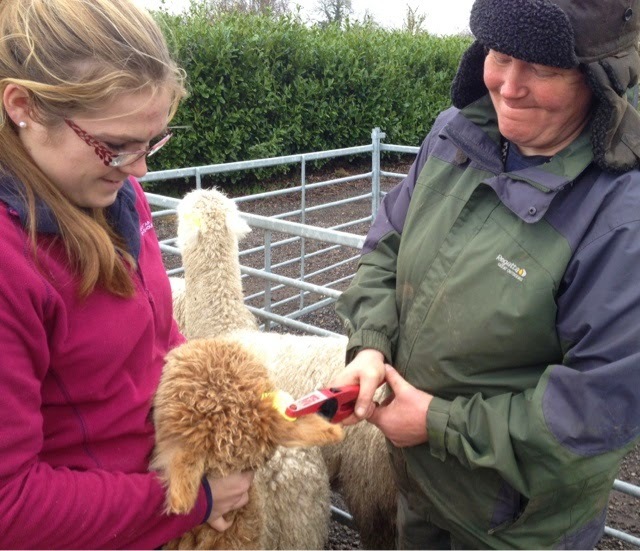 And let's not forget the indominatable Auntie Sandra who took on looking after the little TOFT people in the form of young Lordie whilst his parents worked the room. And of course to the old folks Myra, Audrey and John who got well into the Christmas spirit and sprinkled their happiness over everyone they met along with a new addition to the Team in the form of Scott's new girlfriend Cissie who dropped into the TOFT alpaca experience like she was born to the job adding a very attractive international aspect to the proceedings. 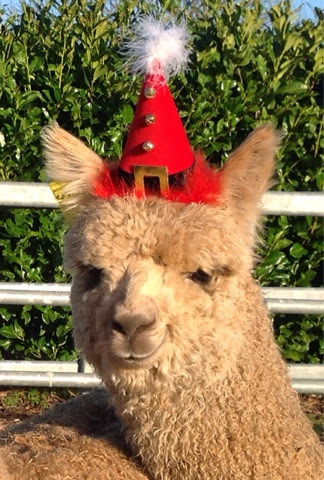 We thank you one and all for another hugely successful and memorable day on the Manor where all our visitors one and all were made welcome and got to share a little of the TOFT alpaca joy. 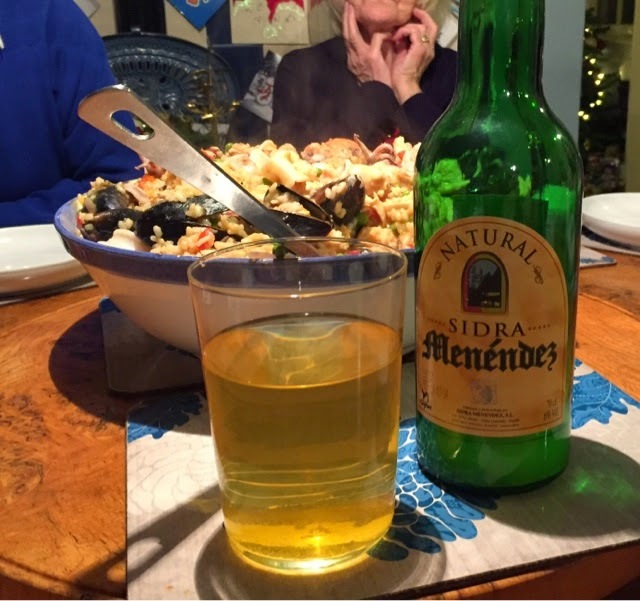 I was so busy I didn't have time to get a photie of you all so please forgive if I missed you - more to follow as we slowly catch up with ourselves coming back the other way over this festive period. Unfortunately I only got into the Studio when the day was calming down. 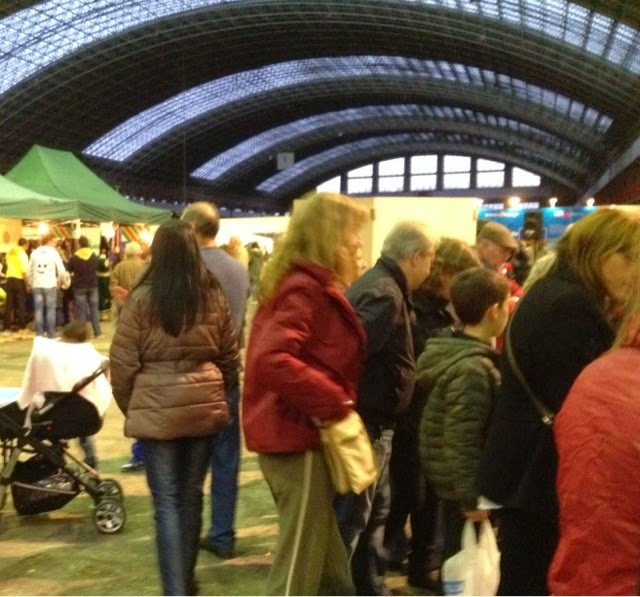 One day I'll make rush hour! Monday and Tuesday spent wiring up the fences with Young Will on the last five acres of new alpaca paddock. We worked like men possessed until it got too dark to be safe to get all the remaining wire up. I can hardly lift my mug of tea today but I'd lay bets that Will at only 17 doesn't have an ache at all. Life's a b****! I've probably got thousand staples to knock in before Crimbo- I hope I'll be able to cut the Turk! Thanks Will for all your help over the past few weeks knocking these fields into shape- have a good Chrissy. OK me and my mate are all ready... Where's the action? 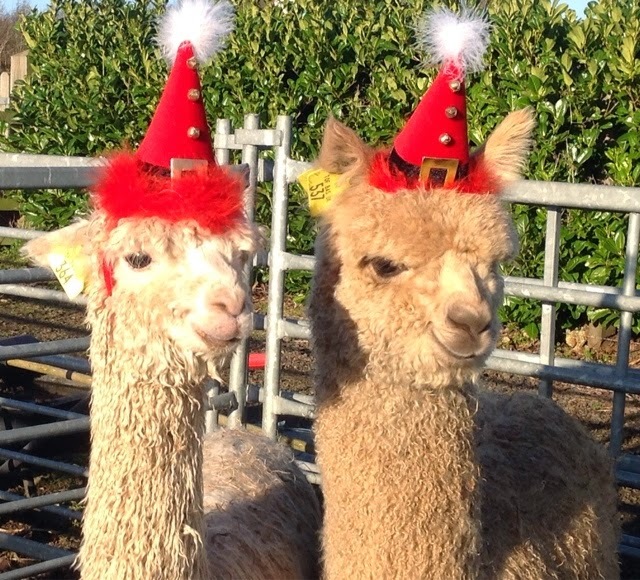 Seems like all the TOFT weaners are keen to join the festivities starting with the TOFT Alpaca Farm Open Day on the 20th of December. Ho Ho Ho...! 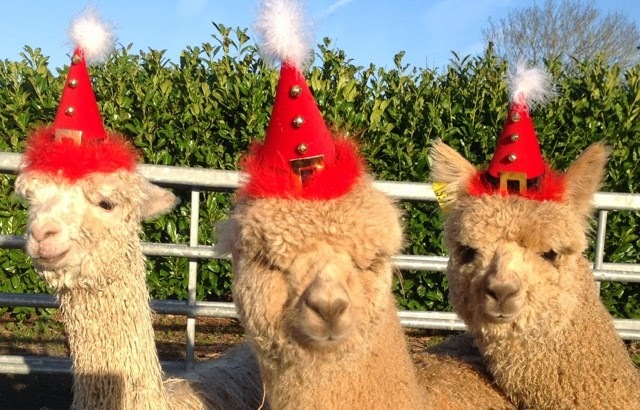 Crimbo has officially started at TOFT alpacas. 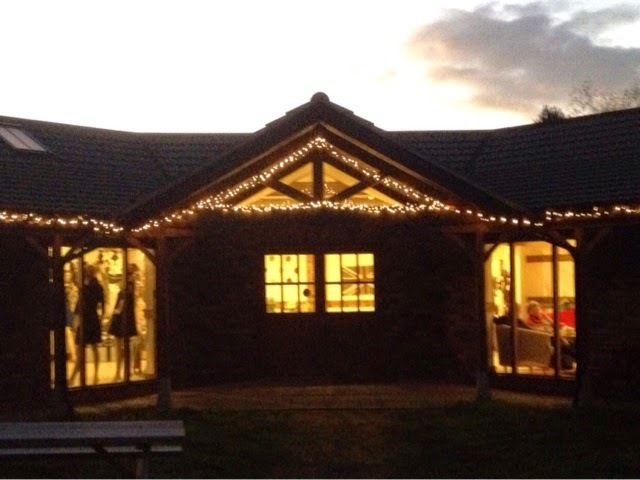 The TOFT Studio is twinkling, trees are sparkling and the mince pies and brandy cream are pouring out of the Cornflower Cafe. It's as cosy as a Hamsters boudoir in the Studio these days. Wires up on the new alpaca paddock. Two strands of plain wire to string tomorrow and three gates to set up and the next five acres will come online. Hey ho, only another five to go and the job will be almost done. Thank goodness it feels like this job has run longer than Emmerdale. 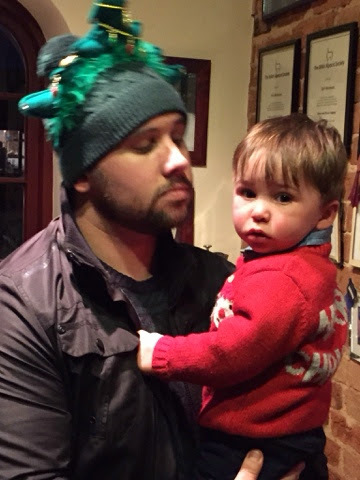 I've set Xmas as the deadline -as you do and if the weather rolls our way we will get there. A few good frosts will help now the posts are all in. It is now almost a year since we took on this land and it has taken all of that time to get it operational. 12 months ago all the hedges were overgrown 25 yds out in the field, there was a decade of debris scattered around and some of the biggest bonfire middens I have ever seen. The fields were four foot high in nettles and thistles covered in huge thick tussocks you could hardly ride the quad over. We started cutting slashing and burning last December and have been working on it most of the year. 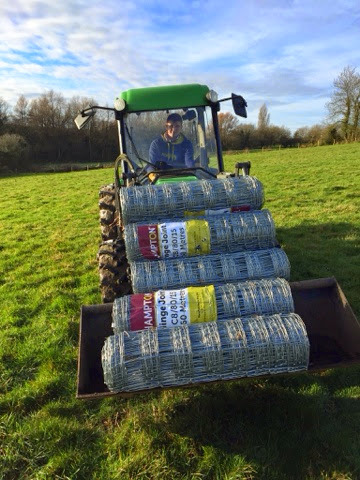 Twelve massive bonfires later and an awful lot of fencing we are almost there. 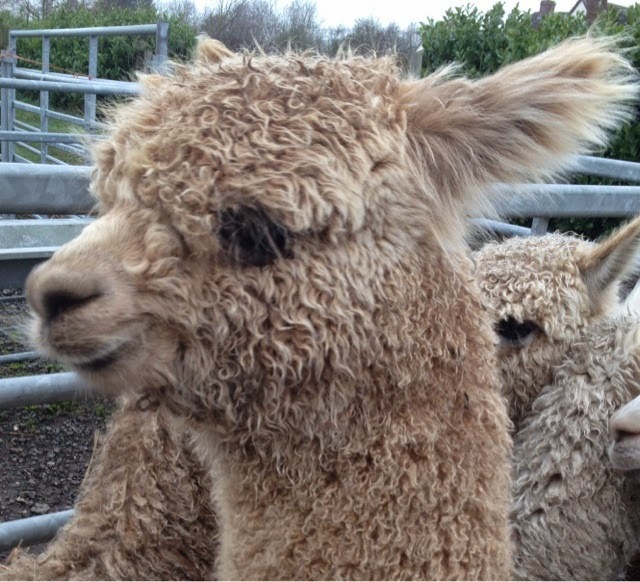 With a bit of luck we will have 15 acres of very tidy new alpaca paddocks up and running in the New Year! And then? Well some downtime I hope and back to the herd. Caught this little brown girl hiding between two fawns yesterday looking for the courage to come forward and join the big school. 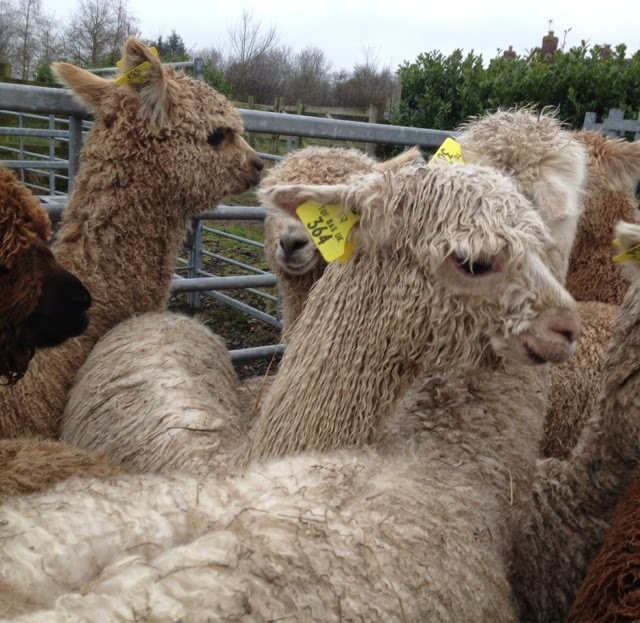 Microchip and tag application day today with seventeen newly weaned cria taking up their residency in the weaner paddocks. 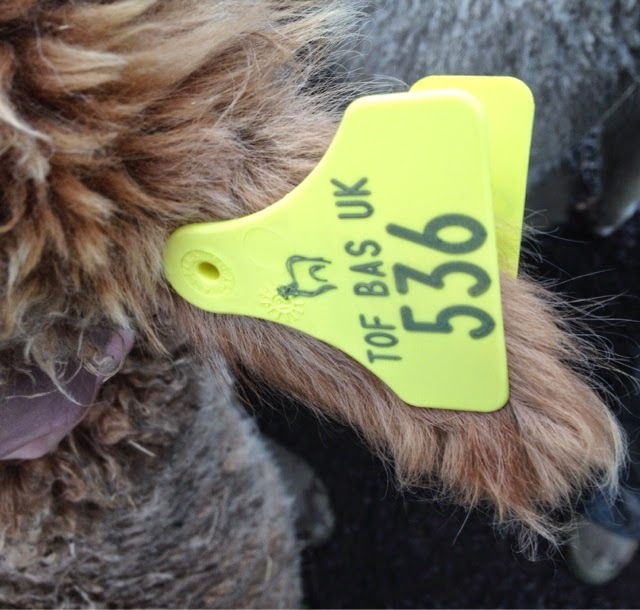 When we wean at TOFT we change the nursery tags to the big flags and microchip at the same time. With Linda tagging, Freya handling and yours truly on the chipper and not one miss or a spot of blood- we were all done and dusted in 30mins. I think we can safely say we now have this routine down to a fine art. 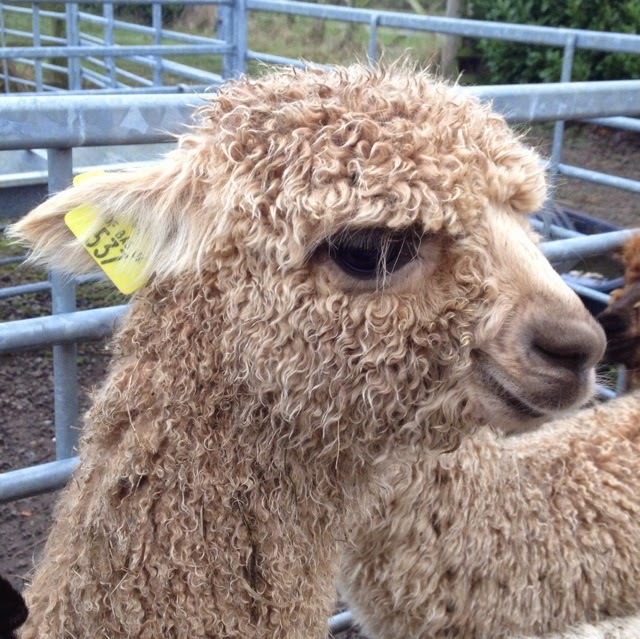 So now the weaners all have their adult tags which as you can see adds another colour to the collective. Now they are popping around the paddocks proud as punch, like kids in new uniforms on their first day at school. One of the boys even came posing for 'new school' photies. Welcome to infant school boys and girls just get on munching now grow into your tags please! 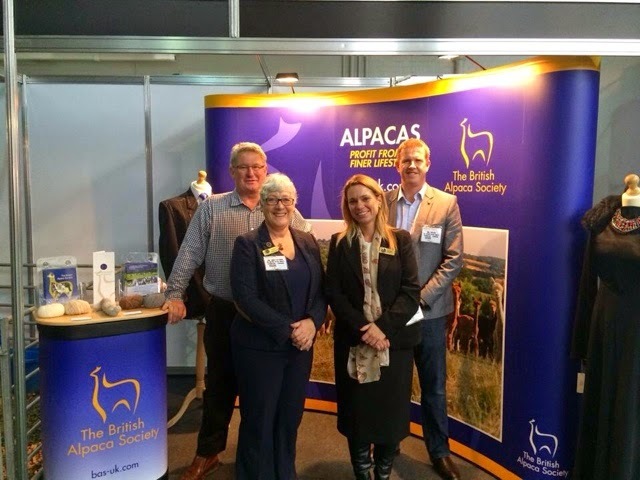 5 am the girl set off this morning with the trailer for Olympia where she is busy promoting Alpacas at the Farm Innovation Show for the next two days on behalf of the British Alpaca Society along with Gary Sanders of Popham Alpacas. The girl will be tired tonight as she will have talked herself to a standstill today about our emerging industry and she had a lecture to deliver. 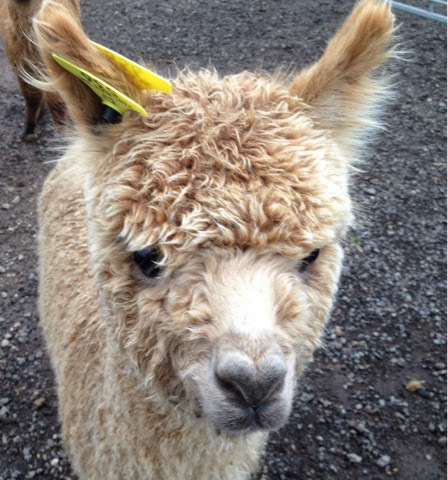 This girl doesn't do ' Sparrowfart' easily so she was huffing and chuffing in the dark this morning as we were loading the alpacas and she will have run on adrenalin most of today. 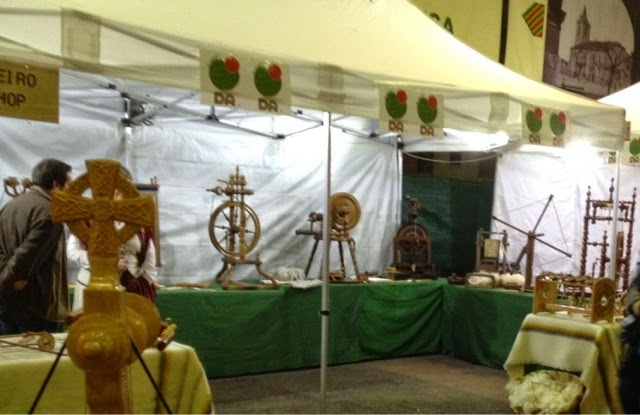 The stand looks great. Apparently there has been a lot of interest throughout the day but I hope they let her get to bed early the night or there won't be a lot left of her coming backup the M1 tomorrow! 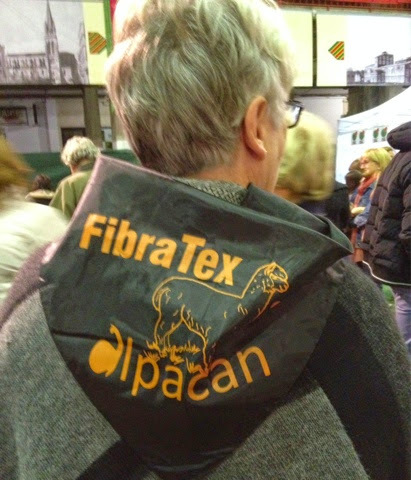 A huge congratulations to Alison Boyden of Alpacas Alto Pas and her merry team of helpers who worked their bandanas to shreds this weekend in organising and executing Fibratex 2014. 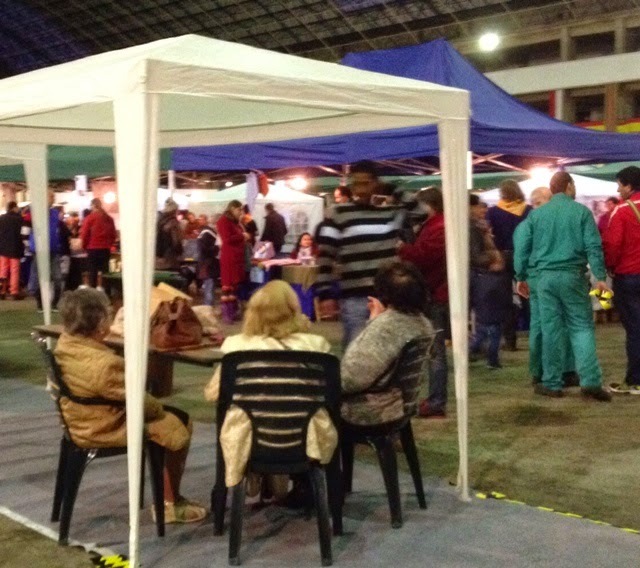 Judging by the crowds flocking around the craft stalls in Torrelavega on the Saturday, and given more people normally turn out on a Sunday, I reckon the whole event was a big success. 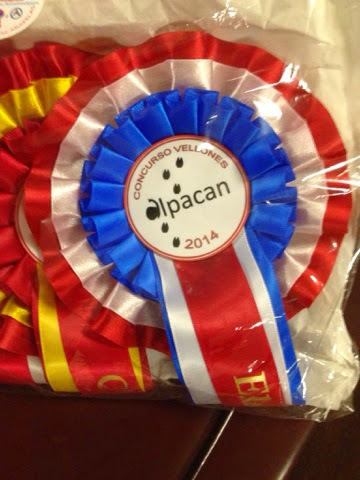 Considering it was a first then it certainly sets a big marker for all the Alpaca breeders in Spain. 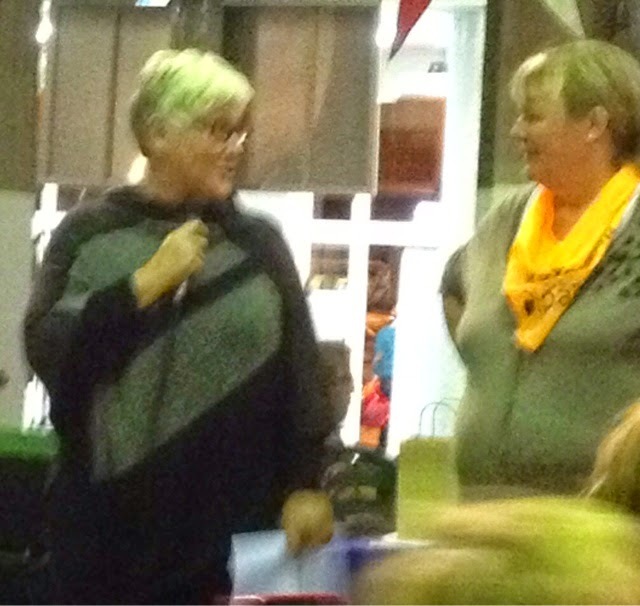 Well done and thanks for inviting us to be part of this. 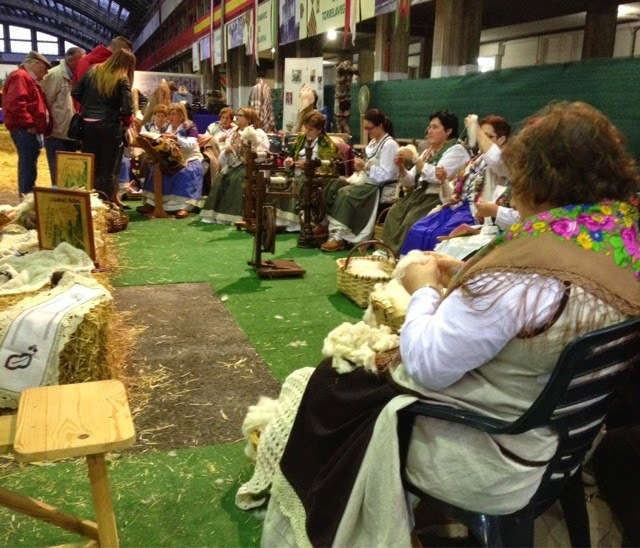 Shirley had a great time judging the first ever Alpaca fleece show in Spain. 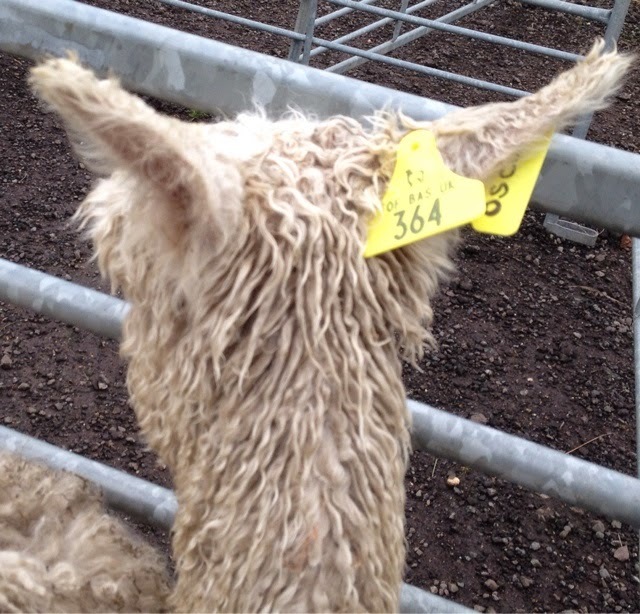 I loved giving the fibre processing workshop to the alpaca breeders and also the new challenge of judging the amazing Creative and Technical yarns spun at the event. 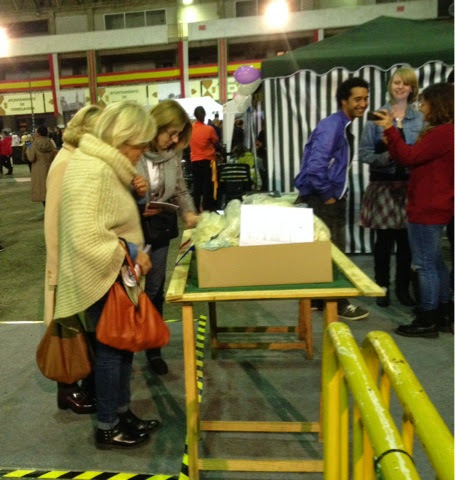 The standard was very high both in the competition and on the numerous trade stands at the event. 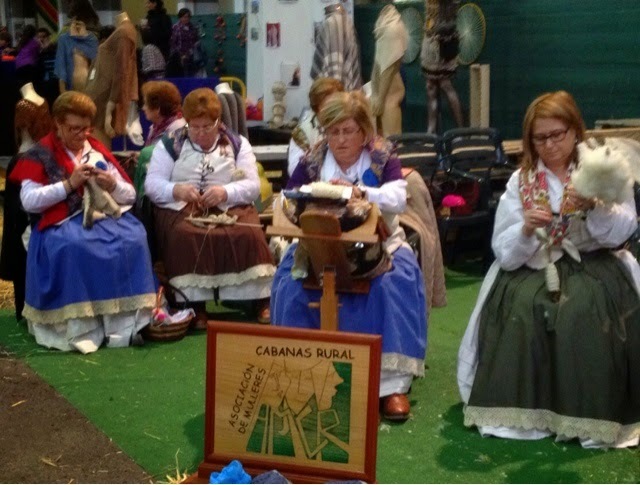 There were some really impressive skills exhibited in the hall - spinning, weaving, felting, lacework, knitting, crochet, dyeing, twisting, cutting and shaping throughout a huge variety of very fine Alpaca Products in both Huacaya and Suri. 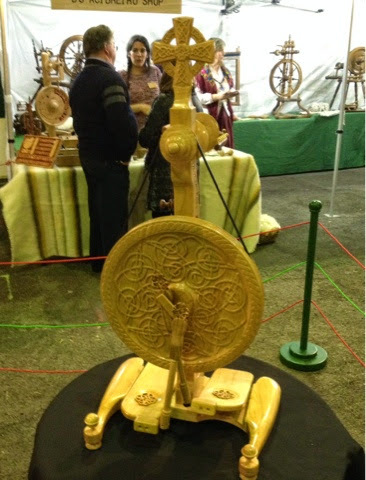 Every stand was busy with creativity and skill making and doing with yarn, cloth, tops, rovings and all manner of variations on those themes. 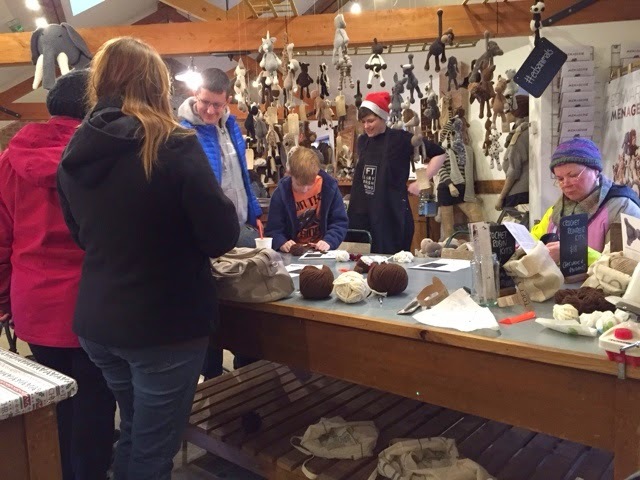 Congratulations to all who took part in this very impressive Alpaca showcase. We are now back at TOFT and plan on staying here for a while. 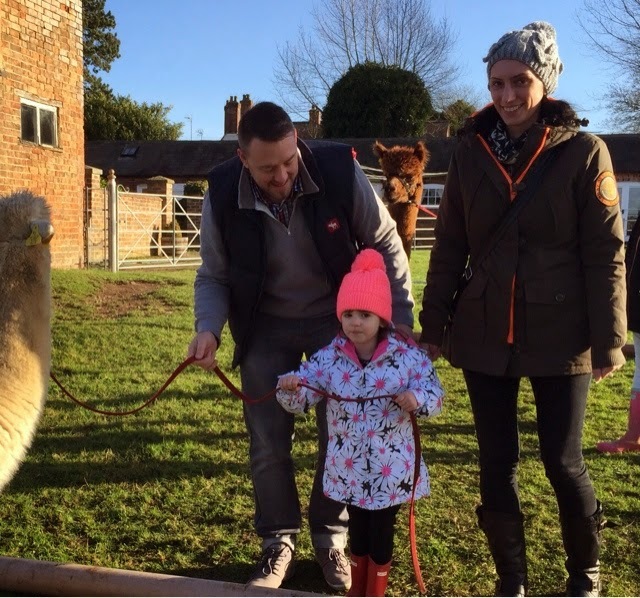 We've enjoyed every single minute of our European alpaca adventures over the past couple of months but it's nice to think we shall be on farm for the next couple of months or so at least. 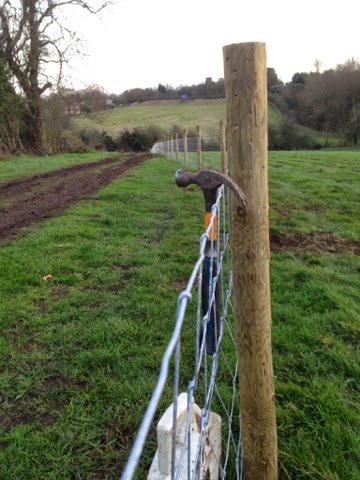 I'm back to the glamour of fencing in the new alpaca paddocks morn. 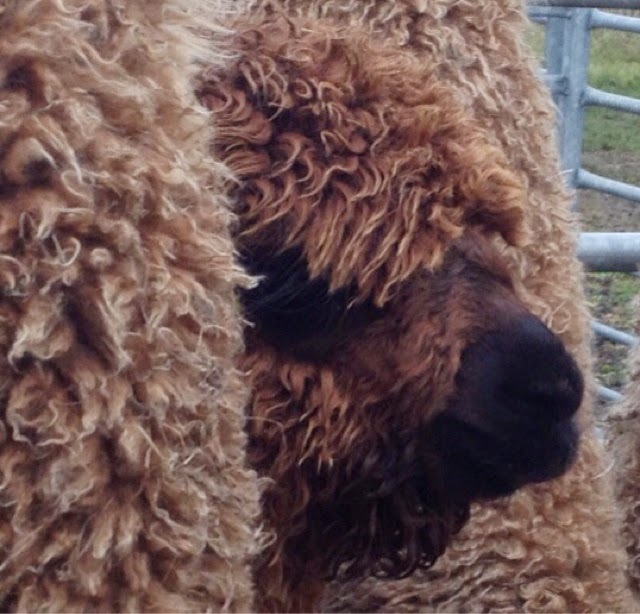 No doubt it will be raining but I shall be comforted by the lingering warmth of all the alpaca breeders and enthusiasts who we have had the pleasure of meeting in the past few months. 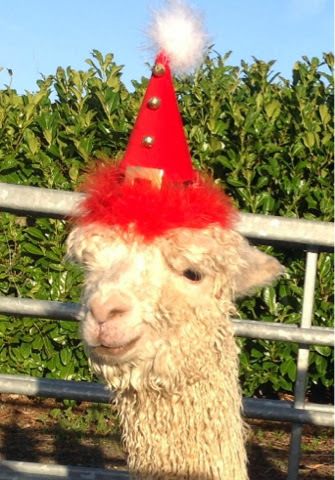 Have a good winter one and all and let's meet up and talk alpaca again real soon. 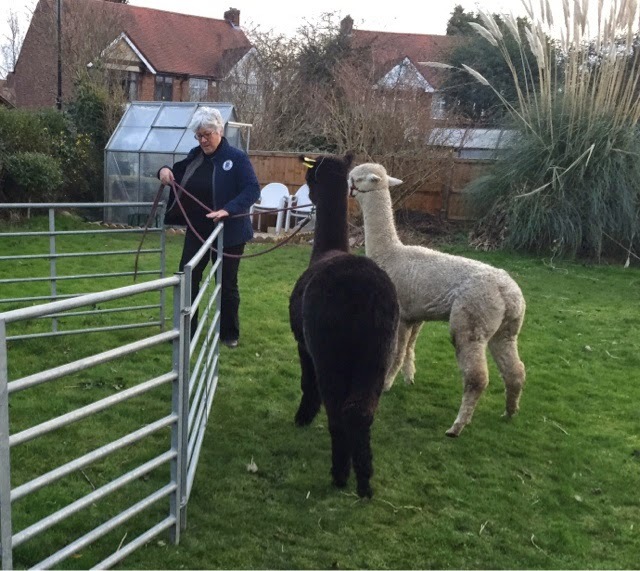 Shirley finished the last of the fleeces yesterday evening and the organisers have this morning to distribute the Alpacan rosettes to the prizewinners and get the fleeces on display by late morning when in 'civilised time' Fibratex 2014 will begin. 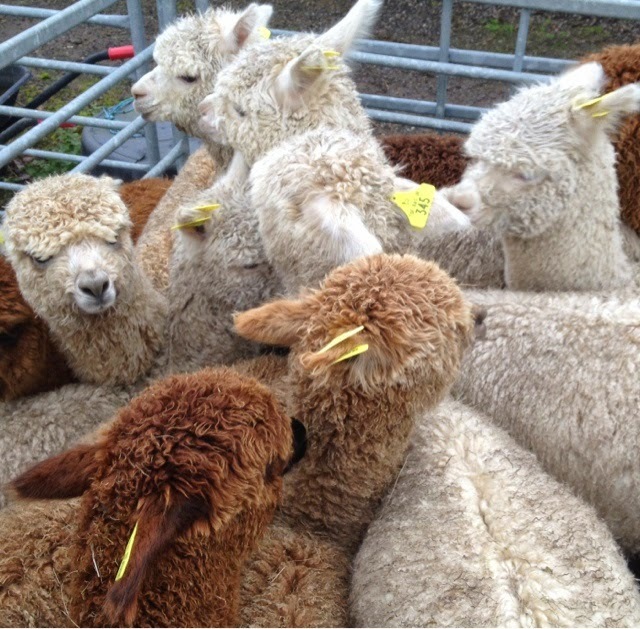 I'm sure this will be the start of great things for Alpacan and the Cantabrian Alpaca breeders. It certainly won't be for the lack of trying Alison Boyden has done the work of ten Duracell bunnies to get this Showcase on the road and there are some fascinating exhibits in the hall. Good luck to you all and thanks for letting us be part of this. 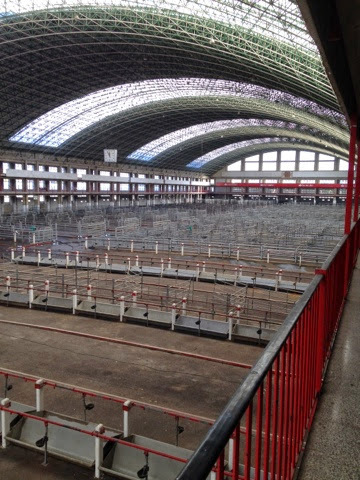 I would pay to see this hall full of cattle and old boys from the area doing business. 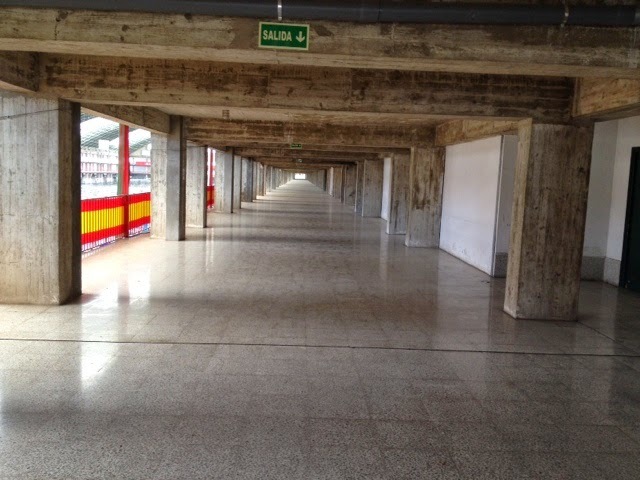 The mezzanine corridor alone could house an army. 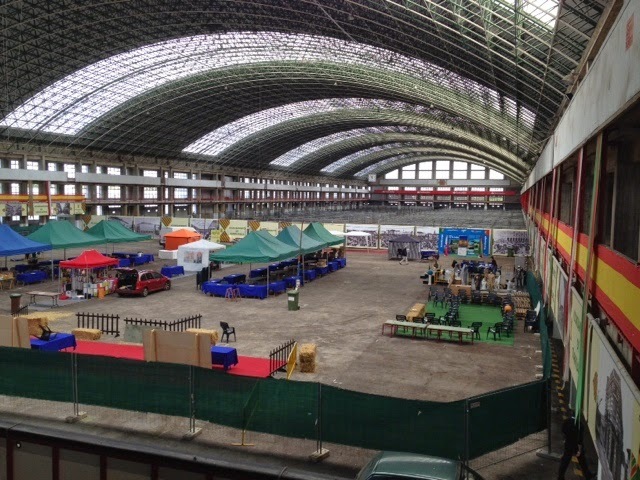 This is the hall where we are working in Torrelavega. It's got to be the biggest Cattle market/auction house I've ever been in. 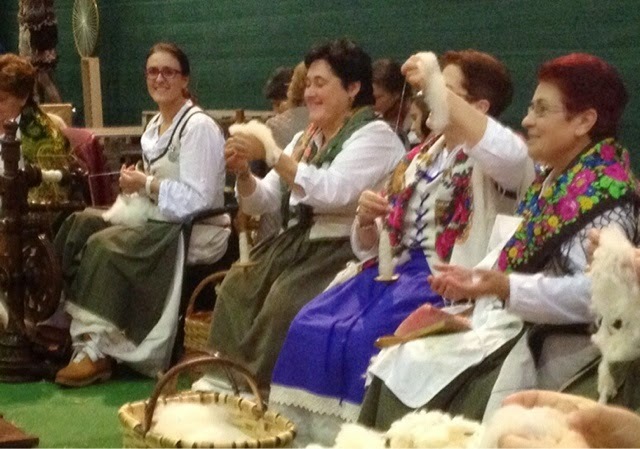 Shirley is upstairs in the boardroom judging the fleeces which have come in from all over Europe as well as Spain. 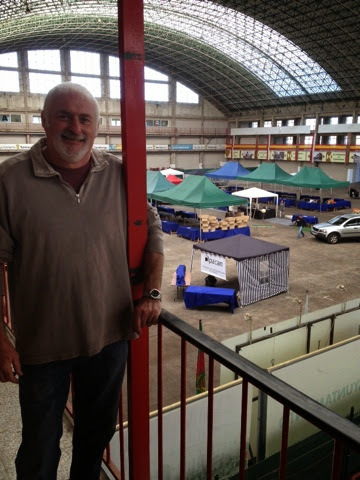 Yes that is Mr Gary Naish star of the BAS husbandry DVD who is over here helping out, behind him you can see the alpaca expo setting up in the end of this enormous facility. Shows on Sat and Sunday.